The USG Open Source Center translated the first news conference held by newly elected President Hassan Rouhani of Iran. Some excerpts are presented below, ordered in pyramid form with the most important first (out of the sequence of hte original). … (NBC correspondent, in English) Mr President, Ali Ruzi, NBC news. Congratulations on your victory. My question is that the State Department has congratulated you and the Iranian people on the election result, and they have said that they want to engage in direct dialogue. Would you be willing to engage in direct dialogue with the United States? 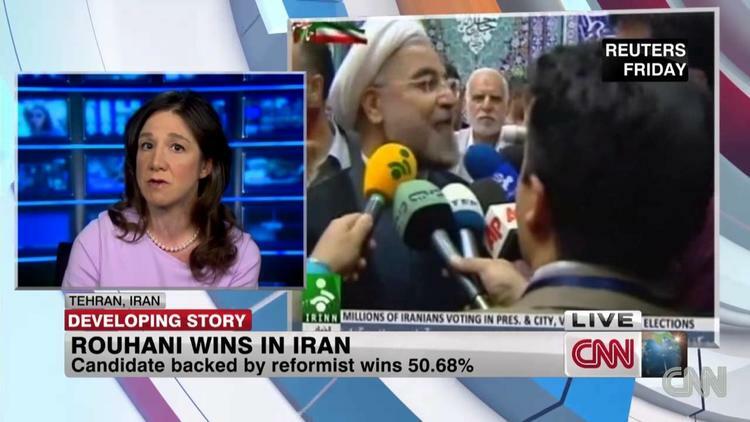 (Rowhani laughing) What a difficult question you are asking me. (Rowhani addressing the translator) Please translate it. (Rowhani) The issue of relations between Iran and the United States is a complicated and difficult issue. It’s not a simple issue. After all, there is an old scar. Prudence has to be adopted to cure this scar. Of course, we will not pursue continuing or expanding tensions. We will not pursue adding to tensions. It would be wise for the two nations and countries to think more of the future. They should find a solution to the past issues and resolve them. They should think of the future. But any talks with the United States have to take place based on mutual respect, mutual interests, and mutual stances. It definitely depends on certain conditions. And those conditions have to be fulfilled. First, as stated in the Algiers Accord (brokered by the Algerian government between the United States and Iran to resolve the Iran hostage crisis in 1981), the Americans have to confirm that they will not interfere in Iran’s internal issues ever. Second, they have to officially recognize the Iranian nation’s rights, including the nuclear right. Third, they should avoid unilateral or bullying policies against Iran. And of course, under such circumstances, the grounds (for holding talks) would be ready. If we feel there is goodwill involved, then the grounds (for talks) would be different. But everyone should know that the future government will not ignore the rightful rights of the Iranian nation under any circumstances. And on this basis, we would be ready for the tension to become less, and even if we see goodwill, it would be possible to take steps toward building trust within a framework that the Islamic Republic of Iran has. And I have pointed out the framework. …. (Unidentified Al-Jazirah correspondent, in Persian) Hello and congratulations to you, Dr Hasan Rowhani. Saudi Arabia’s King Abdallah was one of the first people who congratulated you on your victory. I would like to know how relations between the Islamic Republic of Iran and Arab states, particularly the (Arab) states of the Persian Gulf, will be developing during your presidency. The second question: I would like to know your opinion on the crisis in Syria. Thank you very much. (Al-Jazirah correspondent) (Will you please answer) the second question about the crisis in Syria? (Rowhani) Resolving the Syria problem is up to the people of Syria. The nation of Syria is the final decision-maker on the destiny of Syria. (Rowhani) Of course, we are against terrorism. We are against civil war. We are against other countries’ interference in Syria’s affairs. We hope that with the help of all countries in the region and the world, peace and calmness will be back in Syria as soon as possible. We hope that the Syrian nation’s aim and opinion will be fulfilled in Syria. . .
(Unidentified correspondent) Congratulations president-elect; I am with China’s Wuhan News Agency. I have a question for you. The United States has decided to arm the Syrian opposition. What is your comment on that? Thank you sir. (The interpreter translates the question wrongly) The esteemed president-elect, you have decided to arm Syria. What is your opinion on that? (Rowhani) I have already expressed my views on Syria. The Syrian (crisis) will be resolved through taking into account the views and wishes of the Syrian people. What is worrying our people about Syria is the civil war and the foreigners’ interfering (in Syrian affairs) that must end. The ruling government of Syria must be recognized as the government of Syria by all other countries in the world, and in 2014 whatever the Syrian people prefer will take effect. . .
(Correspondent) I am Ahmadi from the Mehr news agency… You said in your election campaign slogans that you would reduce sanctions . . . How and in what period of time will you do it? Thank you. (Rowhani) The problem of sanctions is a problem that we are facing today. Of course, all of us know that the sanctions are cruel. The nation of Iran has not done anything that deserves sanctions. What has been done is legal and in the framework of international rules. Basically, I want to say that using sanction tools are backwardness tools. Their time has passed, particularly in a situation where even the West is facing economic problems in today’s world. They also know that the sanctions harm the West. If the sanctions benefit someone, it is only Israel. They are not beneficial for anyone else. Therefore, sanctions cannot have a correct basis. In order to reduce and resolve the problem of sanctions step by step, we will take two measures. First, it is to step in the path of more transparency. Of course, our nuclear plans are fully transparent, but we are ready to show more transparency and make it clear for the whole world that measures of the Islamic Republic of Iran are fully in the international frames. Second, we will increase mutual trust between Iran and other countries. Wherever trust is to be undermined, we will attempt to restore it. I believe that mutual trust and transparency within the framework of international regulations and principles are the solution to put an end to sanctions. We will move in both fields. God willing, we will reduce the sanctions. We will first have to prevent new sanctions from being applied, then reduce them and later, God willing, to be completely removed. (Tasnim correspondent)… Dr, if the P5+1 presents your government with a proposal on partially suspending the (uranium) enrichment, suspending a part of it, will you accept it? And can you briefly let us know about your opinion on Almaty 1 negotiations on proposals made with regard to Fordo (nuclear facility), please? (Rowhani) These questions on details have to be discussed at their own right time. You see, the base of the nuclear issue and the issues we have with the P5+1 is that (pauses)… By God’s grace, we will have more active negotiations with the P5+1. This is the main point. And we are of the opinion that the nuclear issue can only and only be resolved through negotiations. Neither threats, nor sanctions are effective. The solution lies in holding negotiations and reaching a mutual trust. The solution of reaching a mutual trust is possible. This was done before. We will benefit from previous experiences. The fact is that the Iranian nation’s undeniable rights will always be considered by the future government. And it (future government) will constantly make efforts to save the people from the cruel sanctions step by step, and to be able to build better relations with the countries of the world, particularly the neighboring states, as I emphasized before. (Maliheh Hoseyni, from Bahar Newspaper reporter) Mr Rowhani, I want to pour my heart out to you. In the past eight years the Iranian nation suffered a lot of hardship and the Press Union suffered even more hardship. Mr Rowhani, the Iranian Press Union, which is the only hope for the journalists, is still closed (the audience applauded). Mr Rowhani, you returned hope to Iran. The expectation of journalists is that you return their only hope back to them. (E’temad correspondent) I congratulate you on your victory on behalf of E’temad editorial team and personnel. My question is about what you said a number of times during your election campaign. You said one of your aims is to eliminate the security atmosphere in the country and change it into a political atmosphere. I have a serious question on this security atmosphere. My serious question is what plans do you have to remove the restrictions imposed on certain political figures, who were revolutionary leaders? (Rowhani) The people changed the atmosphere themselves. The government was to turn the atmosphere into a friendly, interactive, and cultural one. Fortunately, people changed the atmosphere entirely in the past few days. I’m sure…(pauses) Of course, we should not rush in regard to many issues. We have to give them time (to be resolved). Many affairs cannot be handled by one president and the executive power alone. The three branches of power (Executive, Legislative, and Judiciary) have to work together and make efforts together. But I’m totally optimistic that the atmosphere will change. And the ground for achieving many demands will be made ready.